In the article Small Business Website Designs and Browser Wars, we shared the definition of Browser Wars as referring to two specific events - the first during the late 1990's where Microsoft's browser Internet Explorer became dominant and the second which started in 2003 (and continues...) where emerging, open-source, free browsers compete for dominance and jostle for market share. The consequence of the later Browser Wars is that there is a wider Browser Choice in the market. Hence any Small Business Website Design must look great and function perfectly in many different browsers. 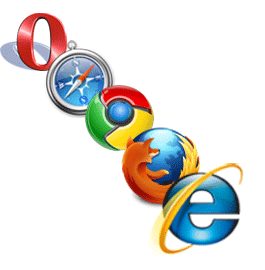 The usage share of Web Browsers is the proportion of all users and all web browsers who use a particular browser. The figures are usually expressed as a percentage. Where it is vital to my role as a Nottingham Web Designer is that it provides the list of which browsers I must ensure render my Small Business Web Designs correctly. It may come as a surprise, but the percentages representing the usage share are approximate. In our day and age, it would have been natural to assume an accurate measure. The figures are usually estimated from looking at the number of visitors using a particular browser to a group of websites. These figures vary geographically and through time. Although Net Quality Nottingham Web Design provides accurate statistics and figures for our client's websites, it is impossible to obtain the overall statistics with the same level of accuracy for every website. Obtaining the usage share of Web Browsers from the number of page hits may be deceptive. Even with the difficulties of obtaining accurate Browser Statistics, there is a general consensus and a pragmatic approach to reveal percentages. If the results from the top 5 Internet usage measurement organisation which are StatCounter, Net Applications, W3Counter, Wikimedia and Clicky, are averaged, then the resulting figures can be considered indicative of the situation. Therefore as a minimum, you should check that your Web Designer has tested your Business Website Design in Internet Explorer, Firefox, Chrome, Safari and Opera, and in the various versions of each Web Browser. If he has not, ask him why not. All our Small Business Website Designs are carefully hand coded and crafted to look great in the browsers we use to develop them, and also in all the main browsers available in the market.